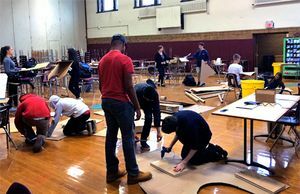 Once you've created a makerspace, create some excitement around it by engaging students with possibilities, supporting colleagues in exploring it, and innovatively using the space. If you build it, will they come? Just because you create a makerspace (PDF) in your school doesn't guarantee that your community will embrace it. Students who have had all personal choice removed by traditional educational models can be passive and feel overwhelmed when faced with real-world problems or design challenges. Academic passivity is common in schools where students swallow content and regurgitate it on multiple-choice tests. Students simply want to know how to get the "A." This type of learning does not stick. Teachers may find the role of facilitator (or "guide on the side") uncomfortable if they are used to being the "sage on the stage." New technology in these spaces may be intimidating. Teachers need encouragement and professional development to change their mindsets and become facilitators of learning. 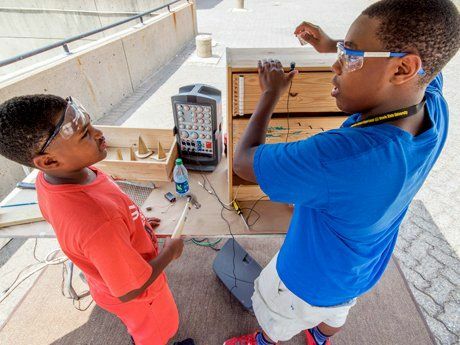 How do you change your culture and ensure that your shiny new makerspace will empower students to acquire 21st-century skills? How do you change the culture of student apathy to encourage a mindset of doing? Follow these steps and design tips to build a culture of making and active learning. Encourage and support student-centered work. Find students who are passionate about tinkering and making, offer a place to work, help with student documentation and course accreditation, and then continue reassuring them throughout the process. If students don't know what problem to tackle, direct them to real-world challenges. Establish a culture of learning by doing. Start the first day with something simple like the Marshmallow Challenge. Use design thinking to manage projects and encourage students to make something, test it, and reiterate. Celebrate failures, both large and small, by insisting that students document (PDF) the learning that results. Honor the outcomes by publicly showcasing projects, either physically through a gallery experience or online through a class website, Twitter, or other social media. As your projects grow in scope, ask your administration for permission to use hallways and common spaces. Think about how your room is laid out, and challenge students to reconfigure it so that it better fits their needs. Lay out supplies so that students can get things by themselves without asking. Small changes like these can empower students and shift their thinking from passive to active. Encourage "early adopters" of maker lessons. Help them connect to others doing this work, both inside and outside your school. It is incredibly powerful to know that you are not alone, and inspirational to see what others are trying. Empower them to share, either informally or at a faculty meeting. Create a professional development day. Teachers repurposing objects during a professional development class on Design Thinking and Making at Scarsdale Teachers Institute. Initiate a summer course that helps teachers adopt the "guide on the side" mindset. 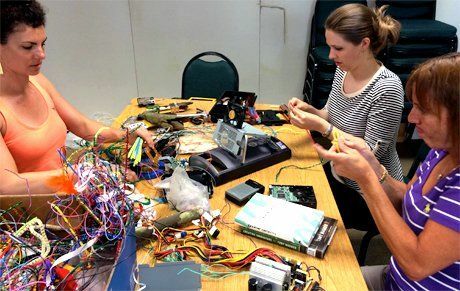 Organize a field trip to a local makerspace to experience firsthand the dynamic of the space and expose your colleagues to both low- and high-tech maker projects. Use the collective to provide feedback. Expose teachers to new technology through thinking routines (PDF) that foster deep noticing. Reassure them that they don't have to be experts, and encourage them to try the first iteration and learn from students' feedback. Increase visibility for projects by repurposing public common spaces. Students work in the gym creating cardboard furniture prototypes. Hack some existing spaces: your own classroom, a computer lab, or a corner of the library that could become a Genius Bar. Enlist students in the redesign. Transform some rooms with moveable furniture and white boards, or simply rearrange what is already there so that the space functions better. Utilize bright wall graphics and way-finding signage to promote new spaces. If possible, use storefront windows to promote curiosity and engage the community in the activities within. Student work, both finished and in process, should be prominently displayed to heighten awareness. Encourage "ownership" of the space by allowing both teachers and students to reconfigure it using flexible, moveable furniture. Promote awareness of the senses. Consider sight, sound, and touch in defining the space. Students can create large, noisy areas or small, private/quiet enclosures with moveable partitions. Color and lighting can be employed to excite or soothe, creating different moods. Furnishings can range from soft, comfortable seating to more durable group worktables. Overhead ceiling lighting can be supplemented with task lighting to create more intimate work areas. Let students' enthusiasm shape new spaces and announce change. We all want our students to be prepared for the future, and incremental, organic change ensures that your school will be ready for a makerspace. How have you created a buzz about your school's makerspace? Please tell us about it in the comments section.